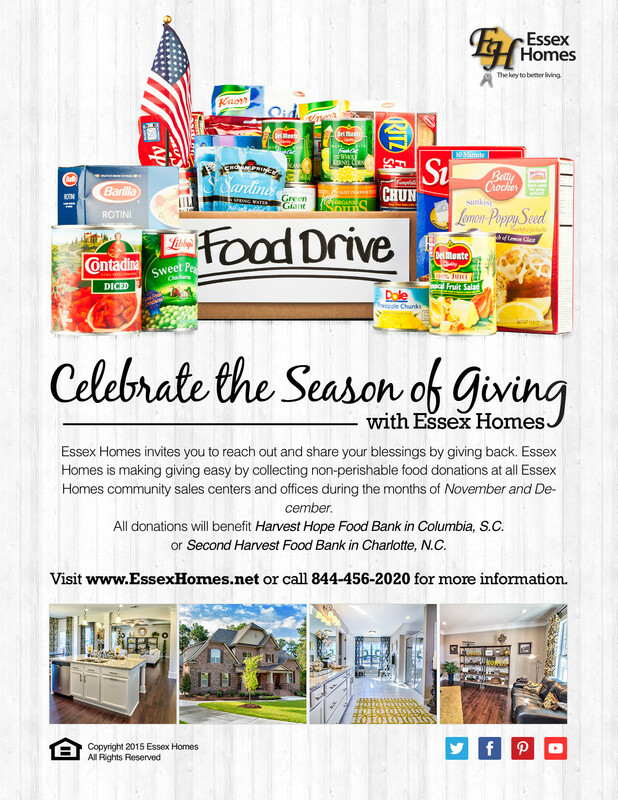 Essex Homes celebrates the holiday season by giving back to those in need through the Harvest Hope Food Bank in Columbia as well as the Second Harvest Food Bank in Charlotte. Essex Homes will be collecting non-perishable food donations at all Columbia-and-Charlotte-area community sales centers and offices during the months of November and December. All food donations must be non-perishable items which can include canned vegetables, canned meats, dry goods, peanut butter, beans and much more. Some of the most needed items at either bank aren’t even food – diapers and detergent can help make a big difference as well. To see more of the most needed items at Harvest Hope, click here. If you don’t have time to stop by an Essex Homes sales centers or office this holiday season but would like to make a monetary contribution, donators can do so by visiting www.harvesthope.org/money or www.secondharvestmetrolina.org. All of Essex Homes’ model homes and sales centers are open Monday through Saturday from 11 a.m. to 6 p.m. and Sunday from 1 to 6 p.m. Essex Homes is asking for any and all donations, “no donation is too small or too big, help us help others in need this holiday season by giving back to our communities” says Mike Cancilla, Columbia Division Manager with Essex Homes. Locations for all Essex Homes communities are listed on their site here. For more information, visit www.EssexHomes.net or call 803-356-8301 in Columbia or 704-423-8988 in Charlotte. This entry was posted in Charlotte new homes, Columbia new homes, Events, North Carolina, South Carolina and tagged Charlotte, Columbia, Essex Homes, Food Drive on November 5, 2015 by Essex Homes. 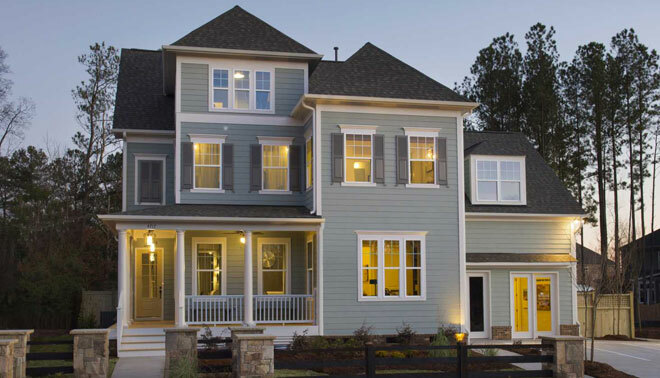 John Wieland Homes and Neighborhoods is excited to announce the grand opening of Habersham in sought-after Fort Mill. Priced from the $350,000s, the builder’s newest club address offers a setting of club amenities, green spaces and a scenic four-acre pond blended with a select offering of thoughtfully designed homes. Each home’s exterior showcases unique details, welcoming front porches and gracious outdoor living spaces. Interiors provide bright, open floor plans with leading features like 10-foot ceilings on the first floor, expertly designed gourmet kitchens, integrated home technology and an array of options. Buyers can personalize their new homes with the perfect features and finishes from the builder’s refined selection of today’s best at the exclusive John Wieland New Home Design Studio, where they will enjoy the assistance of a personal Design Consultant to pull it all together. Additionally, every new home at Habersham is protected by the industry-leading Wieland 5 Year – 20 Year Warranty, homebuilding’s best. Current plans for private club amenities include an entertaining pavilion, swimming pool and playground that overlook a picturesque natural pond. Habersham is also minutes from the Anne Springs Close Greenway, an easy connection to over 40 miles of hiking and biking trails, aquatics facilities, boat rentals, nature center, equestrian center and more. Children residing in Habersham attend Pleasant Knoll Elementary School, Gold Hill Middle School and Fort Mill High School. Both elementary and middle schools were ranked 10 out of 10 by Great Schools™. Discover Habersham today by calling 803-548-5011 or visiting jwhomes.com/Habersham. This entry was posted in Charlotte new homes, New Home News, North Carolina and tagged Carolina real estate, Charlotte, John Wieland Homes and Neighborhoods on October 23, 2015 by John Wieland Homes and Neighborhoods. BridgeMill in convenient Fort Mill is priced from the $300,000s to $600,000s. The neighborhood’s distinctive and diverse collection of new homes features flexible floorplans, refined architecture and luxurious interior designs. Its spectacular array of amenities offers something sure to delight every age and interest. Residents enjoy a 7,000 square foot clubhouse with fitness center, recreation room, gathering rooms and caterer’s kitchen; a competition pool with lap lanes, waterslide, zero entry wading area and water play features; three lighted tennis courts; a basketball court; a sand volleyball court; a private three-and-a-half acre lake with walking trail; a neighborhood park with playground and outdoor entertaining area with gazebo and fireplace; and the new Summer Club with second swimming pool, playground and pavilion. Additionally, BridgeMill’s Chesapeake Designer Model was named a 2015 Aurora Award Winner Best of State by the Southeast Builders Conference. Priced from the low $300,000s to $400,000s, the neighborhood of McCullough offers club living in charming Pineville. McCullough’s historically inspired architecture blends with innovative interior designs from the John Wieland Homes and Neighborhoods Signature Portfolio. More than 80 acres of parks; sweeping greens; an aquatic park with sparkling pool and club pavilion; children’s playground with Kenny’s Street Park; and resident’s club with fitness center, event space and lighted tennis courts coming soon make it easy to find the perfect place to connect, play or just relax. Plus, the neighborhood is just minutes from Ballantyne and Uptown. Olmsted is picturesque wooded setting with club amenities in Huntersville. Priced from the high $300,000s to $600,000s, homes combine classic exterior styling with innovative interior designs from the Signature Portfolio. This one-of-a-kind destination is distinguished by its thoughtful master plan encompassing acres of parks and green space and an 11-acre lake. Residents also benefit from a pool with waterslide, children’s playground and, coming soon, lighted tennis courts. Rose Hill in prestigious Weddington is priced from the high $600,000s. Luxurious estate homes on spacious homesites feature rich architectural detailing and well-appointed interior plans. Surrounded by green spaces and a neighborhood pond, Rose Hill is conveniently situated just five minutes from I-485 and less than one mile from the 265-acre Colonel Frances Beatty Park with tennis, basketball, kayaking, trails and more. *Offer valid only on new John Wieland market home purchases in BridgeMill, McCullough, Olmsted and Rose Hill contracted by October 31, 2015 and closed by November 15, 2015. Offer not valid on pre-sale contracts. Offer must be presented prior to writing a purchase agreement to qualify. May not be combined with any other offer or discount. See Licensed Sales Professional for details. Subject to changes, errors and omissions. This entry was posted in Charlotte new homes, North Carolina and tagged Carolina real estate, Charlotte, John Wieland Homes and Neighborhoods on August 19, 2015 by John Wieland Homes and Neighborhoods.